I got the idea for the title of this book from my husband, who has heard me talk to many constituents over the years and shares my view that politics is at its best when you listen and learn from the people you represent. To me a public servant should have both the grounding and the compassion to carry the common sense and good will of his or her neighbors into the political arena. And when in that arena, whether it be a city hall or the U.S. Senate, that public servant should be expected to work honestly and collaboratively with others who were presumably elected to do the same thing. I know this description of American government might seem better suited to a high school textbook than a contemporary political memoir. And I am well aware that our polarized politics—egged on by supersized outside spending by interest groups on the left and the right—has taken us further and further away from the ideal of value-based and, for that matter, neighbor-based governing. But that is the very reason I wrote this book. At a time when our politics has become increasingly pungent, and politicians are more often lampooned as cartoon caricatures than portrayed as public servants, it is worth remembering why we have this representative democracy in the first place. As elected officials, we were sent to the halls of government by our neighbors to do their work—and much work needs to be done. Remembering our shared experiences with the people we represent makes us better and more accountable civil servants. So this is my story about how I went from leading my suburban high school’s prom fundraiser, a Lifesaver lollipop drive, to winning a seat in the United States Senate. It’s about tackling all the obstacles I encountered along the way—my parents’ divorce, my father’s alcoholism and recovery, tough decisions as a prosecutor, my political campaigns, and Washington’s gridlock—with good intentions and, whenever I could, some good humor. It’s about my immigrant grandparents who settled in Milwaukee, and my Slovenian-American grandpa who spent his life working fifteen hundred feet underground in the mines in Ely, Minnesota. He never graduated from high school, but he saved money in a coffee can so he could send my dad to college. Both my mom’s and my dad’s parents devoted their lives to making sure their children had a better future. My mom and dad carried on from there, both serving the public—she as a teacher, he as a newspaperman. They taught me not only to approach my work with a public purpose, but also to set expectations high for myself, my family, and for everyone I work with. I stopped in my tracks, stacked towels in hand, and thought, this is it, this is the moment . . . maybe not “the” moment, given that she was only four, but certainly “a” moment. What is she going to say? Okay, that was a minor mom victory. Standing outside my daughter’s bedroom door that day, I knew we’d set expectations high enough in our household. And I knew something else. “You can’t have a baby until you run for office and win an election” was not the answer I would have given growing up in Plymouth, Minnesota, in the 1960s and ’70s. Back when I was in fourth grade I was actually kicked out of my cherished suburban public school—Beacon Heights Elementary—for having the audacity to be the first girl to wear pants. This was—mind you—in Minnesota, where I walked to school up the Bezenars’ hill and through the woods, rain or shine, 10 below or worse. I wish I could say that I talked back or started a girls-can-wear-pants petition drive, or even more dramatically, a lawsuit. But since I was the good girl who had never been called into the principal’s office before, who didn’t really know how to take on the likes of Mrs. Quady and talk back, I simply cried. I got a permission slip, walked home, put on a skirt, and returned to school. Now, all these years later, I get to tell my story of how I learned to talk back, stand my ground, and start that petition drive. It’s a story about beating the expectations of our culture and our times, trying my best to stay grounded in the values I learned growing up, and actually getting some things done along the way. The hardest chapters to write were the two about my time in the U.S. Senate, partly because there’s so much to tell, partly because it’s an unfinished chapter of my life, and mainly because I have a lot of mixed emotions about what’s happening in American politics right now. As a U.S. Senator, I’ve tried my best to practice politics the way I think it’s supposed to be practiced—always looking for common ground, and truly enjoying the people I meet along the way. I believe in my heart that courage in our nation’s capital is not about standing by yourself giving a speech to an empty chamber. Courage is about whether or not you’re willing to stand next to someone you don’t always agree with for the betterment of this country. That’s why the first thing you see when you visit my office in the Senate is a smiling photograph of former Minnesota Senator and Vice President Hubert Humphrey in front of his campaign plane emblazoned with his famous nickname, “The Happy Warrior.” I hung it there for a reason. I am convinced that now, more than ever, our nation needs a good dose of the courage and optimism and moral purpose that defined Hubert Humphrey’s life. When you read my story I have one hope: that you will come away from it with some of that Humphrey joy and, despite our turbulent times, a renewed respect and love for our great “American experiment in democracy.” And then, if I was really convincing, I hope that you will find some way, somehow, to be a part of it. For those who are already a part of it, my wish is that you will care for it just a little bit more. 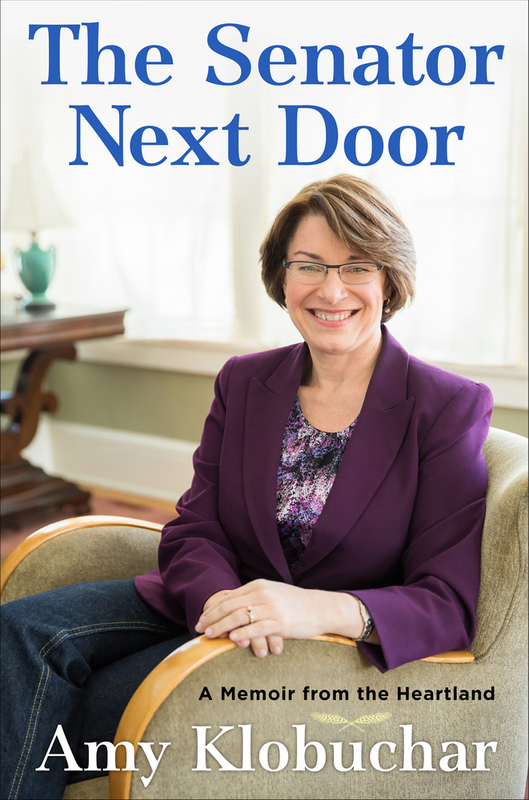 Senator Amy Klobuchar discusses 'The Senator Next Door: A Memoir from the Heartland' on Hardball with Chris Matthews.